Einstein theorized them as huge gravitational fields that sucked in all matter and energy or light. He said nothing could escape them. Hawking basically agreed but said a little radiation might escape them. Now in THEORY E the New Model of our Universe says Einstein and Hawking are 100% wrong based on new observations of black holes. Black Holes repel Protons some say they bounce off black holes. Black Holes emit energy or light, they emit Plasma Bursts. Black Holes have no strong gravitational field. So what are Black Holes? 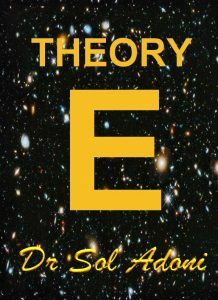 Dr. Sol Adoni the genius that has released the new large scale model for our Universe that says there was no Big Bang and the Milky Way and the Universe is very, very FLAT claims they are a new force unknown to mankind but it very simply is the opposite of Electro-Magnetic force that binds all atoms. This new force is called Anti-Electro-Magnetic Field Theory by Dr. Sol Adoni. You can view his new theory THEORY E the site that explains the Universe in this dimension all matter came from just protons and electrons the building blocks of atomic structure. From just those two things all phenomena in this Universe is easily explained including Black Holes that act as a natural recycling unit of every Galaxy where all atoms are stripped down to just Protons and Plasma Energy so it can be recycled into new atoms and build new hydrogen stars which can then create helium, just hydrogen and helium account for almost 100% of every thing. A tiny fraction of 1% is the rest of all elements that can be easily created with the explosion of a hydrogen sun as it exhausts its fuel source of Hydrogen Atoms. Hydrogen atoms account for over 90% of the physical universe with Helium creating all the rest. Yet a tiny percentage of atoms do create everything else such as oxygen and gold and other elements.